My friend Nicola gave me this recipe which she found in her new favourite Waitrose recipe book and promised me it was really good. 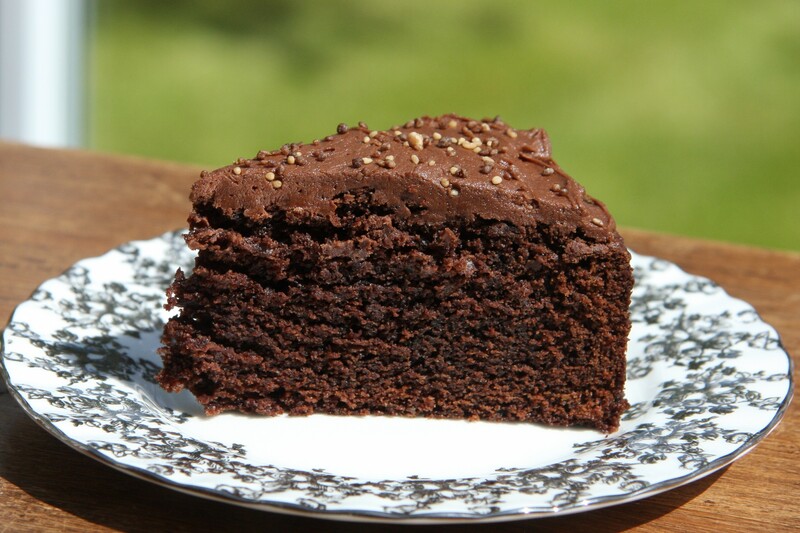 A great chocolate cake was exactly what I was looking for as my friend Karyn had asked me to make a birthday cake for her son Roan: he doesn’t like icing so it was really important to find a chocolate cake that wouldn’t be dry without it. Last year he wanted a cake with mint Aero bubbles and I had to use enough icing to get them to stick. This year he wanted Ferrero Rocher (no, I had no idea they were a top treat for a 10 year old boy either!) and I wanted to use as little icing as possible to decorate his cake. When I made Roan’s cake I made one and a half times the recipe quantity to make sure we had a cake as a tester. I put a layer of buttercream and some mocha sprinkles on the top of ours. It didn’t disappoint. 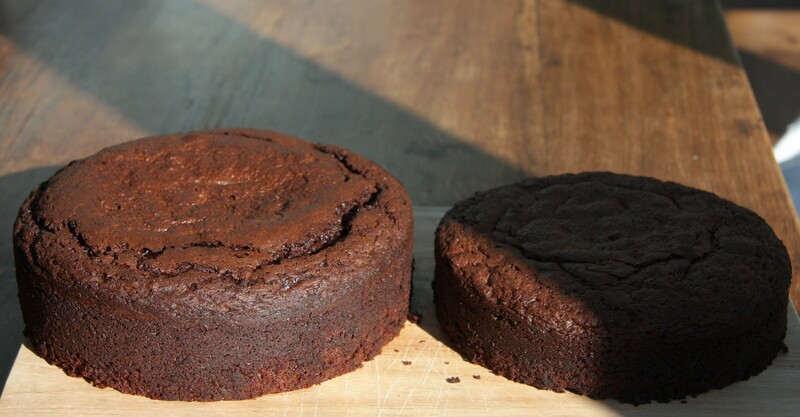 The original recipe is for a two layer cake but I wanted a lovely moist, dense cake so I made both of my cakes in loose-based, deep-sided cake tins: I put two thirds in an 8″ cake tin and one third in a 7″ tin. 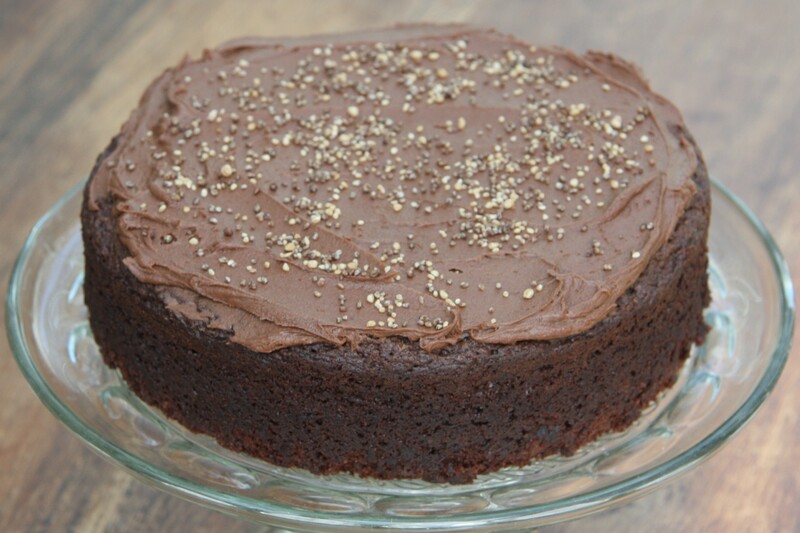 The original recipe was very confusing and difficult to follow: it is for a cake with icing and it listed the total quantities of the ingredients rather than separating them out for the cake and the icing. It took me several readings and quite a lot of maths to figure out the amounts needed just for the cake so that I could then scale it up. But cake will prevail with enough determination. And if nothing else I now have the recipe in an easy-to-follow format! I had originally thought I would get away without using any icing at all on Roan’s cake. In the end I used the thinnest layer on the top just so I could give the cake a minimal amount of levelling and to give the drizzled Nutella a backdrop. Luckily he didn’t notice. Set the oven to 170ºC. Grease, and line the base of, a deep-sided, loose-based 8″ cake tin. Put the cream, vanilla and half the sugar into a saucepan and heat until just below boiling point. Cream the remaining sugar with the butter until it is light and fluffy. Bake in the oven for around 40 minutes to 1 hour. The cake will be firm to the touch and a skewer inserted into the centre of the cake should come out clean. 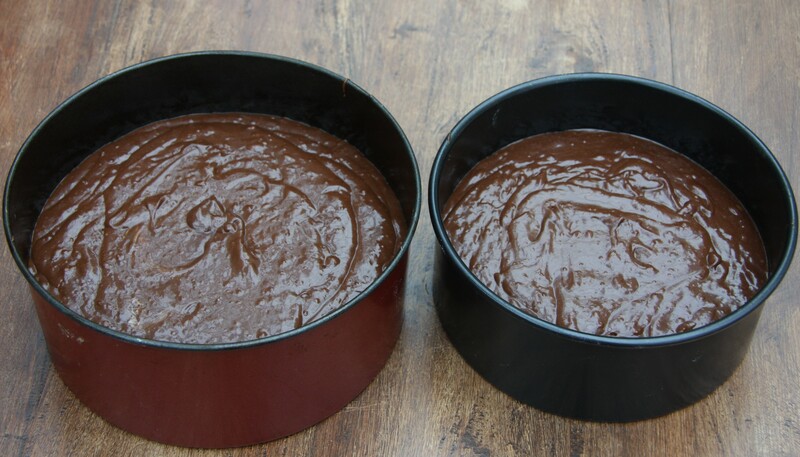 If the cake starts to brown too much on top towards the end of the cooking time you can cover it with aluminium foil. Turn out and make sure the cake is completely cool before decorating as you wish. Just a sprinkling of icing sugar would be enough, or you can go all out with the decorations. They are yummy! Thanks very much, your cake looks great. I love Ferrero Rocher! This is a genius cake idea! Thank you – wish I had thought of it!!! 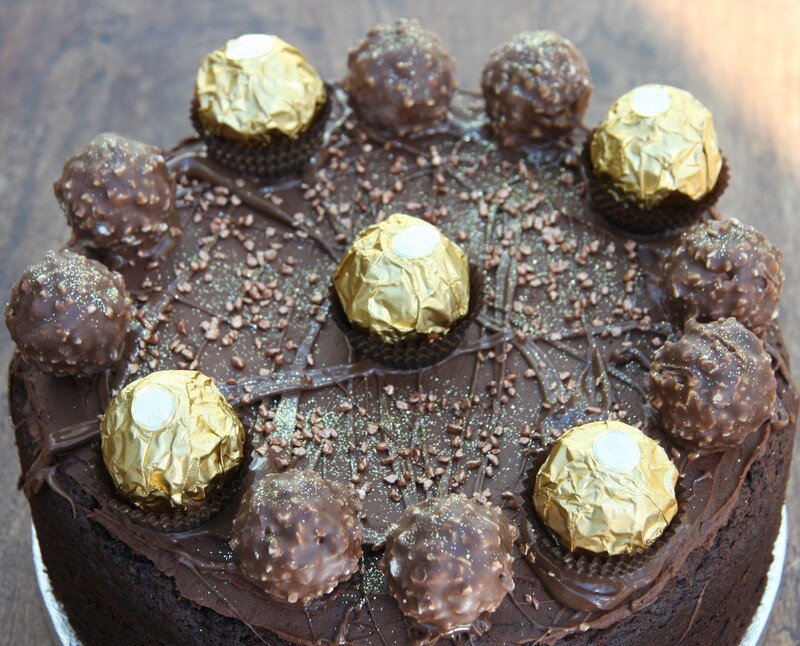 This looks amazing- love the addition of ferrero rochers! 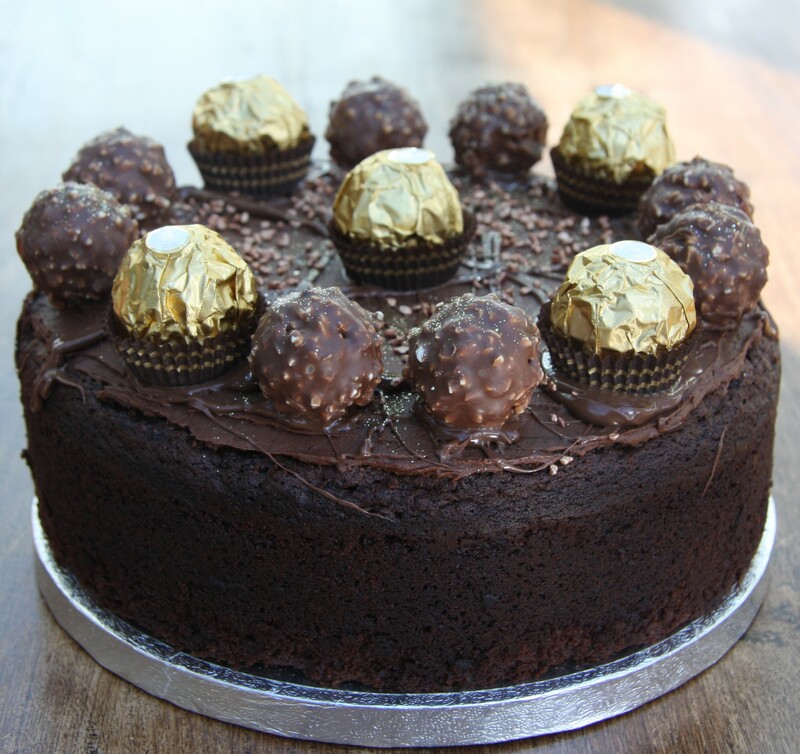 I usually make chocolate Victoria sponge for Malteser cakes but you could also use this – it is a bit richer so just depends on what you would like. Thank you for your comment and hope your granddaughter has a lovely birthday!